When it comes to asbestos removal, expertise is key. High quality and the highest level of safety are an absolute must. I am particularly proud of our achievements. Asbestos removal is a very precise job that requires special knowledge and experience. 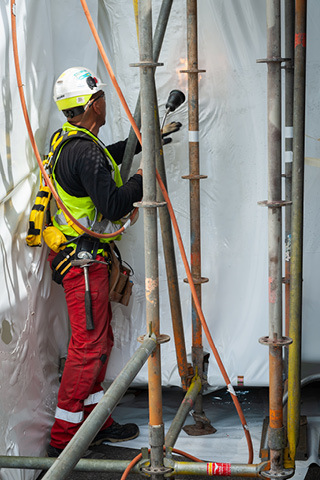 Our employees have many years of experience with large and small asbestos removal projects in the industrial and civil engineering sector, at home and abroad. Because asbestos removal carries huge risks, our employees are given intensive training. Viabuild holds all the necessary certificates to ensure thorough and safe asbestos removal, with the correct cleaning procedures for all possible variations: bound or free asbestos, sprayed asbestos, and more. We also work in high-risk sectors and situations, such as the petrochemical and process industries. Jobs are also often carried out at height and hazardous products are used. We ensure that the work proceeds smoothly and safely, anytime and anywhere. We have all the permits and signs at our disposal.